In the last year, thousands of people have flocked to North Dakota to protest a pipeline they claim could contaminate water. But they’ve left behind enough detritus that they’ve risked causing an environmental disaster for the Missouri River, North Dakota’s governor said in a statement this week. The state has seen record snowfall this year, which has buried huge amounts of trash, camping materials and even vehicles abandoned by protestors. Though as many as 10,000 people have participated in the protests, many of them coming to North Dakota from out of state, few remained to help with the mess. The Standing Rock Sioux Tribe is leading the cleanup, working in collaboration with local law enforcement and the state. To fund the restoration of the land, the tribe is using some of the money donated for the pipeline protests, local media reported. This week, a cleaning crew mapped out eight- to 10-hour shifts to remove the massive amounts of garbage left behind by protestors. Even so, the effort is expected to take weeks, the tribe said. As that cleanup effort began, North Dakota’s governor said, a “rogue group of some of the more aggressive elements of the protest camp” attempted to set up an alternative camp on nearby private land. Law enforcement warned them to leave, but many protestors refused, prompting a confrontation that ended in 76 arrests Wednesday. 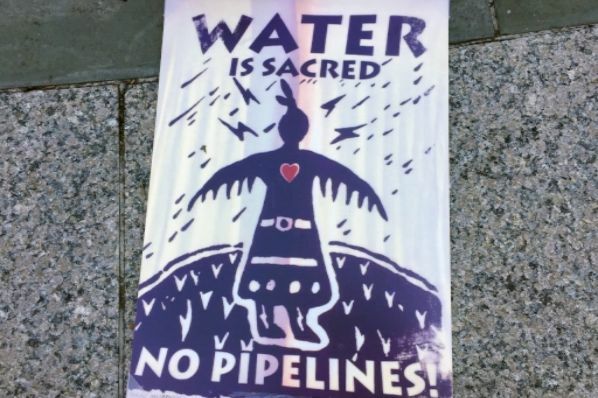 Meanwhile, at the direction of the Trump Administration, the U.S. Army Corp of Engineers is moving forward toward granting a crucial easement that would allow the pipeline’s construction to proceed.